Hesketh Bank Wastewater Treatment Works (WwTW) were awarded this project to contribute to the improvement of bathing waters and to achieve compliance and improve shellfish water quality. This will be met by delivering a spill frequency of no more than three spills per bathing season, or 10 spills per year from the Hesketh WwTW Storm Tanks. All the new structures were fitted out with new mechanical and electrical equipment to enable the process of treating the effluent to be effective and meet the drivers for the project. 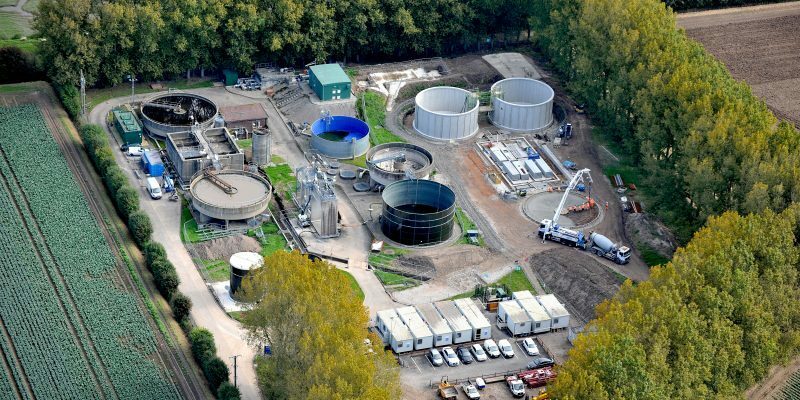 The new activated sludge plant process was also implemented for the first time in the UK. Design for Manufacture and Assembly (DfMA) was extensively utilised on this project where C2V+ constructed two new 12.5m diameter 6m deep final settlement tanks, one new 13.3m diameter and 6m deep primary tank and a new aeration tank which is 18.125m long 9.5m wide and 6m deep. Also fabricated off-site, was a glass coated sludge tank 5.5m diameter and 7.5m deep and a glass coated steel pumping station 3.4m diameter 7.1m high. All these tanks were constructed above ground and the off-site. DfMA has resulted in less work at a height and the quality of the constructed elements is of a very high standard. DfMA was also a benefit in the programme due to the ability to plan the sequencing of the structures and made the works less vulnerable to weather events. C2V+ creates a unique blend of expertise in consulting, design, design-build, operations and programme management, with a provision of complex engineering solutions in the water and wastewater industry.